If you have never had the pleasure to enjoy a meal in an Iranian or Persian restaurant, you should add it to your bucket list and make a plan to go without delay. If you’ve experienced this cuisine, you’ll never forget the wonderful flavors and fragrances that permeate this delectable food. Persian food includes a wide variety of vegetables, including eggplant, zucchini and tomatoes, rice dishes and combinations of herbs and spices that are unique to this cuisine, including cinnamon, sumac, saffron, and cumin. Many of the foods are grilled, making it a healthy choice for most. Like other Middle Eastern countries, the food of Persia has been influenced by its’ neighbors and conquered regions at various stages throughout its’ history. Thus there has been shared culinary influences to and from Turkish, Mesopotamian, Levantine, Greek and Central Asian cuisines, with smaller touches from Russian cuisine. Persians love their rice, so you will also see a vareity of rice dishes available to accompany the main course. The rice with sweet and sour cherries ( Abdalo Polo) is a MUST. You shoould definitely not miss this fabulous dish! Torshi: A traditional Persian mix of chopped pickled vegetables Mediterranean Chopped Salad: Usually includes chopped tomato, cucumber, green pepper, parsley, lemon and olive oil. 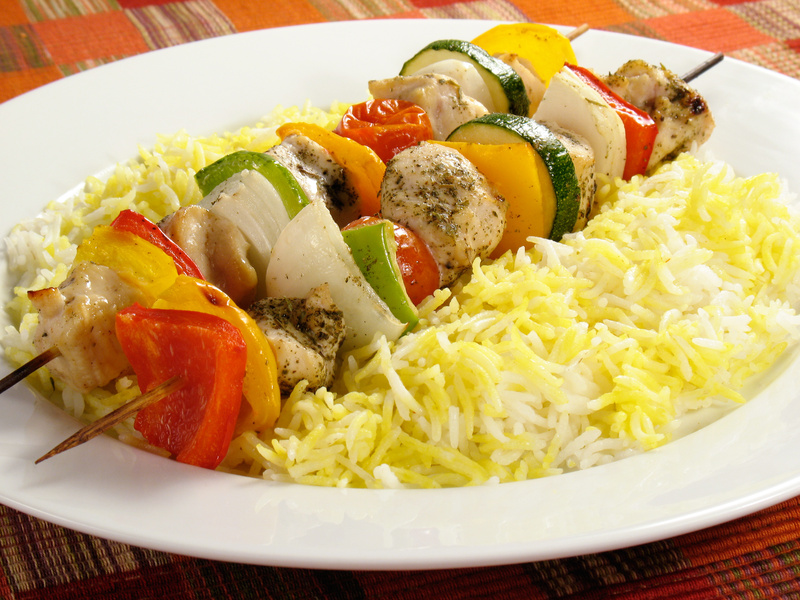 It’s easy to make good choices in a Persian restaurant as the entrees all tend to be grilled. Portions tend to be large, so sharing is ideal. The platters of rice tend to be quite big, so it’s wise to order just one plate or rice for two to four people. A good way to start the meal is with a plate of the various dips. This will provide you a taste of many flavors, all to be enjoyed with the delicious pita bread. For dessert, share one serving of baklava or ask for fresh fruit. Try mint tea to accompany your meal as a healthy alternative to soda or alcohol. If you are trying to lose weight: Opt for grilled vegetable, fish or chicken kebab. Ask for extra vegetables in place of the rice. Or share one plate of rice with the table. As all portions are usually large, consider sharing your main course if you are also having an appetizer. If you have heart disease or high cholesterol: Choose the vegetable or fish kebab as these are the lowest in saturated fat. If they have salmon, that’s an excellent choice. For an appetizer, the humus, babaganoosh or salad would all be ideal. The yogurt is made from whole milk, so it will be high in saturated fat. Share with the table if you would like to try it. If you are vegetarian or vegan: Choose the vegetable kebab as your main dish. There are many side dishes that are vegetarian and/or vegan. If you are vegan, try the humus or babaganoosh. Most salads are also vegan. You can always ask for the cheese to be deleted. For vegetarians, there are many yogurt dips to also partake. These pair well with the delicious pita bread on the table. If you have prediabetes or diabetes: All of the kebabs are good choices. To lower the glycemic index of the meal, ask for vegetables in place of the rice. When it comes to dessert, if you desire something sweet, ask for fresh fruit. Mint tea is a great way to end the meal. It also promotes healthy digestion. Just in case you’re planning a trip to NYC in the near future, here are our fave picks. Enjoy! Lisa Stollman, MA, RDN, CDE, CDN was recently honored as the 2015 Outstanding Dietitian of the Year by the New York Academy of Nutrition and Dietetics. She loves traveling the world and experiencing new foods and cultures, and meeting interesting people. Lisa is the author of the ebook The Trim Traveler: How to Eat Healthy and Stay Fit While Traveling Abroad (Nirvana Press 2014) and The Teen Eating Manifesto: The Ten Essential Steps to Losing Weight, Looking Great and Getting Healthy (Nirvana Press 2012). Lisa maintains a nutrition practice in NYC and Huntington, Long Island where she specializes in weight management, diabetes and travel nutrition. Lisa is also the CEO of Eat Well Restaurant Nutrition where she collaborates with chefs to get healthy dishes on the menu. For more info on Lisa, visit here.